The CISSP Official (ISC)2 Practice Tests is a major resource for CISSP candidates, providing 1300 unique practice questions. The first part of the book provides 100 questions per domain so you can practice on any domains you know you need to brush up on. After that, you get two unique 250-question practice exams to help you master the material and practice simulated exam taking well in advance of the exam. The two practice exams cover all exam domains, and are included in identical proportion to the exam itself to help you gauge the relative importance of each topic covered. 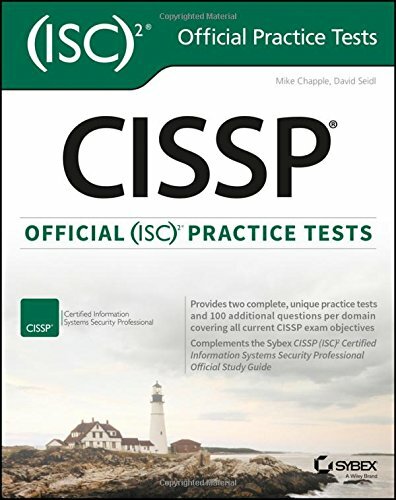 As the only official practice tests endorsed by the (ISC)2, this book gives you the advantage of full and complete preparation: coverage includes Security and Risk Management; Asset Security; Security Engineering; Communication and Network Security; Identity and Access Management; Security Assessment and Testing; Security Operations; and Software Development Security. These practice tests align with the 2015 version of the exam to ensure up-to-date preparation, and are designed to simulate what you’ll see on exam day. The Certified Information Systems Security Professional exam is refreshed every few years to ensure that candidates are up-to-date on the latest security topics and trends. Currently-aligned preparation resources are critical, and periodic practice tests are one of the best ways to truly measure your level of understanding. The CISSP Official (ISC)2 Practice Tests is your secret weapon for success, and the ideal preparation tool for the savvy CISSP candidate.